Few events over the past few decades have given rise to an amount of debate and speculation concerning the state of the European Union (EU) and the future of European integration as the economic and financial crisis that began in 2007. In spite of substantial media, policy-making and academic attention, the fundamental questions of why and how the euro area (EA) has remained not only intact but also expanded and integrated further during the crisis require deeper theoretical investigation. One needs to understand not only the economics but also the politics and institutions of the crisis. A lack of such an understanding is the reason why a number of observers, at least initially, had a hard time making sense of policy-makers’ decisions (and pace thereof), including why the EA did not implode as some predicted. Economic theories provide a certain perspective for why the crisis occurred and what economic policies were and are needed to resolve it; however, they fail to capture the deeper roots and management of the crisis. 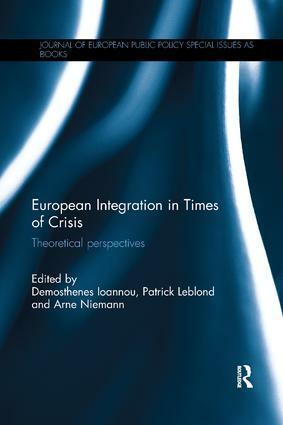 In order to improve our understanding of a discussion that has oscillated between fears of EA disintegration on the one hand and the concrete advancement of integration during the crisis on the other, this special collection brings together leading scholars of European integration who apply key theoretical approaches – from liberal intergovernmentalism and neofunctionalism to other prominent theoretical accounts that have been applied to European integration such as historical institutionalism, critical political economy, normative theory, and a public opinion approach – to the economic and financial crisis. The contributions seek to analyse, understand and/or explain the events that occurred and the (re)actions to them in order to draw conclusions concerning the applicability and usefulness of their respective theoretical perspectives. This book was published as a special issue of the Journal of European Public Policy. Demosthenes Ioannou is Principal Economist in the Directorate General International and European Relations of the European Central Bank. Patrick Leblond is Associate Professor of Public and International Affairs at the University of Ottawa, Senior Fellow at the Centre for International Governance Innovation (CIGI) and Research Associate at CIRANO. Arne Niemann is Professor of International Politics and Jean Monnet Professor of European Integration at the University of Mainz. This series seeks to bring together some of the finest edited works on European Public Policy. Reprinting from Special Issues of the Journal of European Public Policy, the focus is on using a wide range of social sciences approaches, both qualitative and quantitative, to gain a comprehensive and definitive understanding of Public Policy in Europe.